“Bend to Fit” easily molded without tools. Color Coded Straps facilitates brace application. Bacti-Ban keeps covers cleaner and more odor resistant than competitive braces. Conforms to the shape of the hand accommodating different degrees of finger contracture. Ideal for severely contracted fingers. 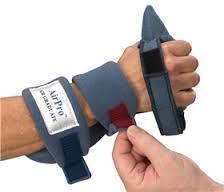 Removable cone shaped palmar air bladder can be used independently of wrist support. Ongoing Care Solutions, Inc., is the leading provider of contracture management orthotic devices in the U. S. OCSI offers SoftPro static orthotics for positional therapy, AirPro orthotics for the management and rehabilitation of severe contractures, DynaPro orthotics for the management and rehabilitation of mild to moderate contractures including orthotic therapy for patients with spasticity, and OrthoPro orthotics providing functional support in rehabilitation for orthopedic indications.